Good Friday 2019 and we went out on our 1st day trip of the season. We had a full boat thanks to Matt and his family choosing a day out with Andrea Jensen. Everyone onboard seemed to enjoy the great scenery along the way. Sorry there were no Dolphins today! Can We Remember How the Sails Go Back On? (I cannot believe its Easter already). Something important is missing from the boat? Yes you guessed it, the SAILS! We are not going to get far with out them. But before they can go back on we had some blocks to change at the top of the MIzzen mast. Thankfully we had a brave volunteer. Thanks Ant! Ella, in the meantime was getting to work on some sanding and painting. Those all important finishing touches make all the difference! Great work guys. Thanks. All Part of Life’s Rich Tapestry, But I Could do Without This! If you have read my earlier blogs you will know that I was diagnosed with diabetes type 2 at Christmas time. I was back in the UK and went to the Dr’s with my sore feet and two blood tests later it was confirmed. My blood glucose levels were sky high but I had no other symptoms to speak of, so why me???? What have I done wrong to become diabetic at 50 years old, (possibly younger, since I have had sore feet at night, for over 3 years – and I mean uncontrollable burning, pins and needles, numbness, truly excruciating)? The answer to both questions, is of course, that we don’t know. I do know that my foot pain is neurological nerve damage, caused by the diabetes and of course that does not happen over night and it is non reversible, unfortunately! Why did I not go to the Dr’s earlier? The really annoying fact is, I just ignored the signs, but to be honest the only sign was sore feet! How was I to know that this was a sign of a much more serious disease – a silent disease of the modern age? I wasn’t. To be honest it is still a huge mystery, what has caused my diabetes and I will probably never get to understand it fully. What I do know however, is that I can no longer binge on chocolate, sweets and cakes (not that I did very often) and my diet has had to change drastically. Since Christmas I have adopted a very controlled, low carbohydrate diet based on my Dr’s advise. I have had to learn what foods contain high levels of carbohydrate and sugar and avoid them completely (banana’s!!!???). I have read all there is to read on the internet about type 2 diabetes and record everything that I eat in a day, into a special Low Carbs Diet Program to help me calculate the total carbohydrate content of each meal. I also have to read the nutrition panels on every packet of food I buy, looking at Carb. and sugar content and that is not easy at my age. The writing is so dam small, I need to carry a magnifying glass now too! Col and I have each managed to lose 7Kg in 3 months. I probably could do with losing another 5Kg, but I would never have considered myself obese by any means. All this weight loss should have helped my glucose levels drop to normal. That is what I was hoping anyway. But guess what, after 3 months of a low carb diet (less than 130g per day), my glucose level have only reduced slightly. I have been monitoring my bloods weekly, with a home test kit from Boots. So, on Monday this week I attended the Diabetic clinic at Bosa hospital. After reviewing my glucose test results (which I have recorded for the past 3 months) and carrying out their own tests, I have been given Insulin to inject x 4 per day before meals and at night. I still cannot believe this is really happening. I am diabetic and having to inject myself with Insulin at 50 years old! WHY ME????? I have been back to the hospital again this week for a review since starting the Insulin injections 4 days ago and my dosage has had to be increased but only slightly. Thankfully my blood glucose levels are now in the normal range. I have to monitor my bloods x 2 per day and can adjust my dosage accordingly. It has to be said that diabetes has totally taken over my life (and Col’s). I have to plan every meal, when to take an injections, when to take bloods. Nothing can be spontaneous anymore. I have to carry a ruck sack around with me containing all my drug taking paraphernalia. Worst of all, and this is a real bummer, I am facing my 1st Easter ever, with no Easter Egg! We still have a lot to finish off on the boat before next week which is Easter. We want to be ready for paying guests by 19th April. Our pre season on-line bookings are very slow this year and we think maybe Brexit is to blame. But that is all I am going to say about that! Our volunteer crew arrive from the UK on Sunday too, which will mean lots of training needs to start next week and we hope they catch on quick! So back to Villanova Monteleone, we came here at the weekend due to the rain forecast in Alghero. I have posted some pics which I took this morning from our roof top terrace. 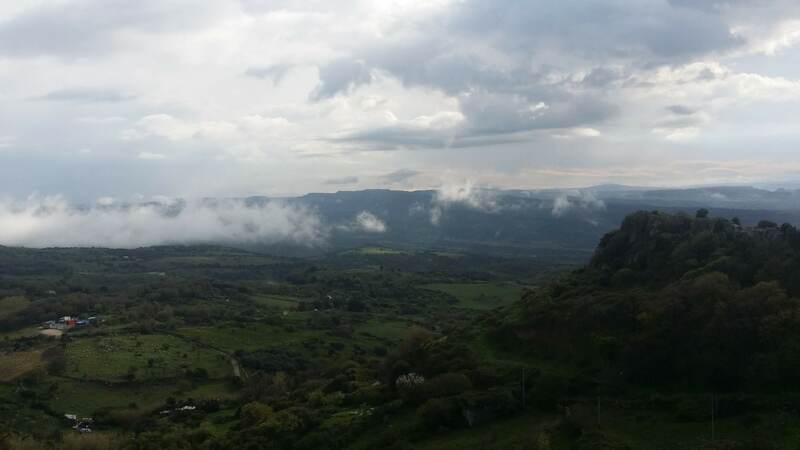 As you can see the sky is a bit gloomy, but we never tire of the fantastic views across Monte Minerva, Rocca Doria and beyond, which we overlook from our roof top vantage point. Isn’t it stunning? We are 576 meters up above Alghero and on average it’s about 5C cooler up here, so today it was 8.5C when we go up, a bit chilly! 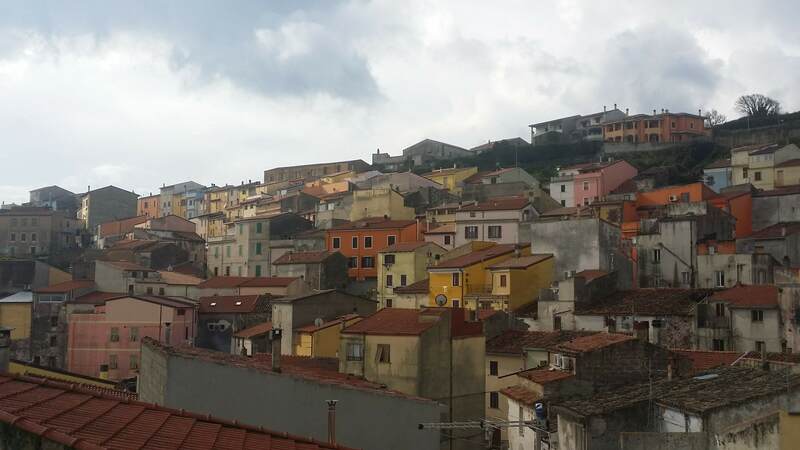 Our mountain top village is very rural and very traditional Sardo, that’s why we love it. It’s worlds apart from bustling Alghero city, but only 23 Km away. There are about 2,000 inhabitants who rely heavily on a Pastoral existence, most men being farmers, shepherds mainly. Families tend to share a small holding, somewhere in the surrounding countryside with small numbers of sheep, goats and cattle (and of course the loyal sheep dogs) which provide both their food and livelihoods. There is a large, local modern looking dairy cooperative in the village, which employs locals making very well known Pecorino cheese for the export market mainly. The locals speak Sardo, not Italian (so much for us trying to learn Italian, which we are doing, all be it very slowly) and are predominantly erderly. Life here is very simple and very family orientated. The young leave the rural villages (once they have finished school) for the busier towns and mainland Italy, where they try to find work. English was not taught in schools in Sardinia until very recently, so only young Sardinians know any English. 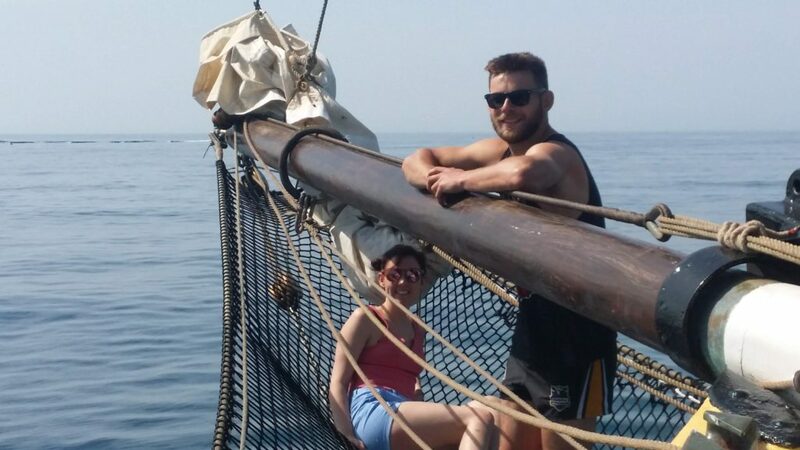 We are very excited to offer an EVENING SAIL on Andrea Jensen. 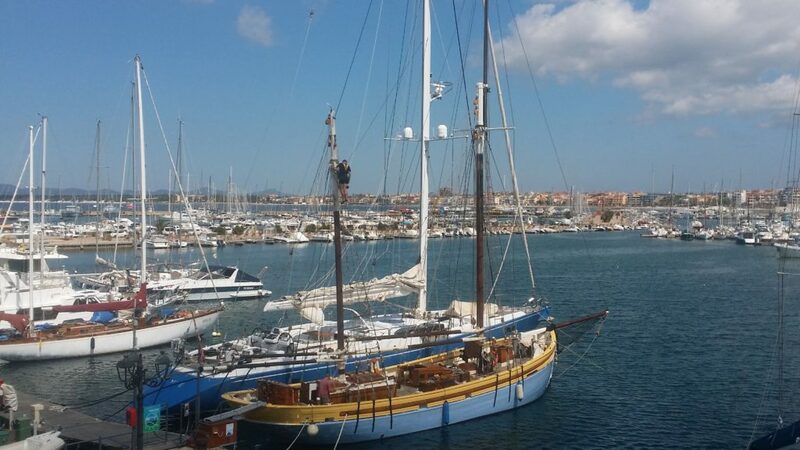 We will sail from Alghero port at 17.00 and return around 19.00. On offer is a FREE glass of Akenta, (with additional glasses for sale at 4 euros). The Evening Sail tour is available from 19th April. Yesterday we sailed back to Alghero from Bosa. We headed out of the marina at about 12.30pm, having just been put back into the water. The weather was just perfect. Slightly cloudy skies but the sun kept appearing through and that made it comfortably warm. The sea was exceptionally calm as there was little to no wind. Just perfect for spotting dolphins we thought and we were not wrong. 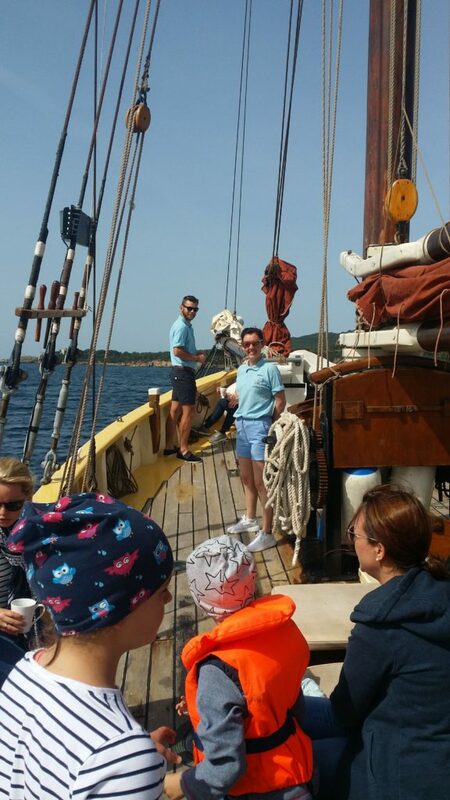 As we approached Spiagga Poglina, with Alghero in our sights, Colin spotted them, slightly ahead of us, port side. 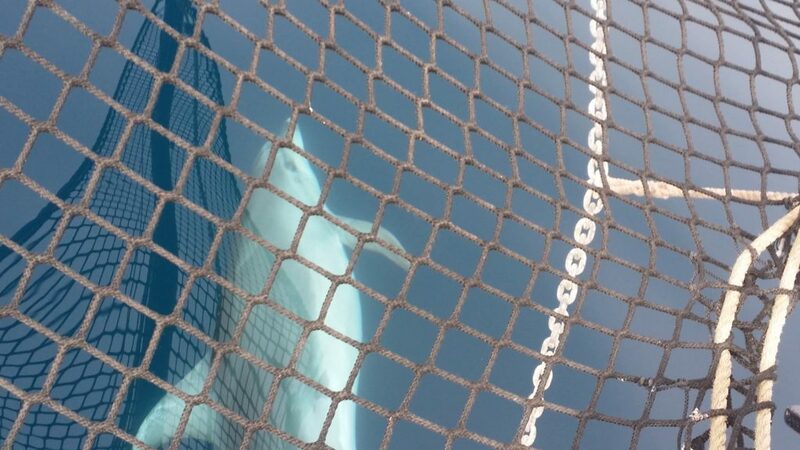 I immediately grabbed the phone and went to the bow of the boat with the hope that the dolphins would join us for a play. They did exactly that, they headed straight for our boat to play in our bow wave. There were 4 and they were clearly having a great time, swimming together under the bow sprit net. I managed to get some great shots of them. Then to our surprise they chose to circle back behind us and began to jump and flip in and out of the water. Our own personal show that was clearly natural to them. To show off in front of a captive audience. Truly awesome for Colin and I. Go to our Gallery for more fantastic photo’s from yesterday. You tube also has some fantastic videos to watch.